The group – which includes the John Muir Trust, Mountaineering Scotland and the RSPB – is asking for a temporary ban on all mountain hare culling on grouse moors until measures are put in place to ensure their numbers can remain at acceptable, sustainable levels. The Scottish Government has a duty to maintain mountain hare populations in a state of good health, otherwise it may be in breach of its legally binding international obligations for this species. However, mountain hares are now routinely culled on a large scale across many grouse moors in Scotland. In 2014, the coalition warned the Scottish Government that the ‘voluntary restraint’ that was claimed to be in place was unlikely to protect these mammals from wide-scale culls on grouse moors, including in the Cairngorms National Park. Since then, there have been multiple reports of culls being carried out across the country – suggesting that voluntary restraint has been ignored. These culls are believed to be having a serious negative effect on hare populations. In some areas it has been shown that the culls are leading to severe population declines and potentially even local extinctions. Duncan Orr-Ewing from RSPB Scotland, said: “The Scottish Government needs to do more to safeguard these iconic species of our upland areas. In 2014 we had serious concerns that the notion of voluntary restraint would be ignored by many in the grouse shooting industry and, with the evidence of culls continuing on many moors over the last three years, it seems that these fears have been well founded. “The start of the mountain hare season has already begun meaninghare populations will continue to be put at risk by unregulated culls that we believe, are resulting in localised disappearance of hare populations. 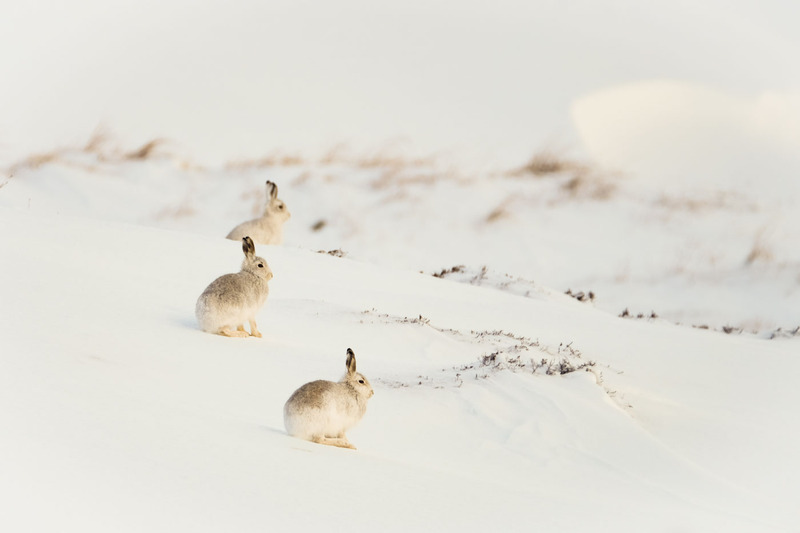 We still do not know what impact these large scale culls are having on mountain hares’ wider conservation status and this could mean that the Scottish Government may be in breach of its legally binding international obligations for this species. Susan Davies, Director of Conservation, Scottish Wildlife Trust said: “Mountain hares are an iconic species that act as an indicator of the ecological health of our uplands, and seeing them gives much pleasure to hillwalkers and tourists alike. “There has been continued and widespread culling throughout the period of voluntary restraint that was called for three years ago to allow research to be carried out. This suggests that some grouse moor managers have no concern for the long-term viability of mountain hare populations.